Tune in to the Cooking Channel on March 31, 2016, at 10:30 a.m. EST, and enjoy Chef Emeril Lagasse’s visit to Christini’s Ristorante Italiano! We are absolutely thrilled to be visited by one of the most respected chefs in the industry. The one and only Chef Emeril Lagasse recently paid a visit to the renowned Christini’s Ristorante Italiano to tape a segment for Emeril’s Florida, a premier show which airs on the Cooking Channel. Chef Lagasse spends time with owner/restaurateur Chris Christini to enjoy spectacular, authentic Northern Italian cuisine and to talk about Chris’ history and philosophy about what it takes to make a very successful restaurant. Be sure to tune in to see some of the other celebrities and dignitaries that have been drawn in by Christini’s outstanding reputation. Since 1984, Christini’s has been serving the Orlando area with genuine Italian cuisine in an award-winning setting with the best service and food available in Central Florida. 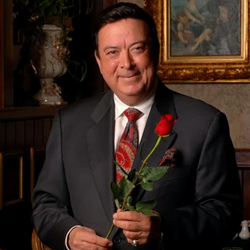 Christini’s attention to detail and 45 years of experience in fine dining culminate in an astounding experience that has made the restaurant one of the most awarded establishments in Orlando. The satisfaction and delight of the patrons bring them back time and time again. Reservations are strongly suggested. Call Christini’s Ristorante Italiano at 407-583-4472. For more information about Christini’s, including the menu, private dining options, and directions, please visit the website at http://www.christinis.com. View a clip from the show by clicking here. Christini’s has become the definition of fine dining in Orlando, known for their quintessential service and high-quality, classic Northern Italian cuisine. Superb dishes, excellent service, and a transcendent and comfortable ambiance all blend together to construct the definition of fine dining. Along with their distinguished service and high-quality dishes, they also have an award-winning selection of the finest wines from around the world, including Italy, California, France, Chile, Australia, and Germany, which complement your entire dining experience. Featuring authentic Italian cuisines and wine, Christini’s is the epitome of fine dining and is dedicated to providing guests with excellence through every facet of their dining experience. View our commercial by clicking here.